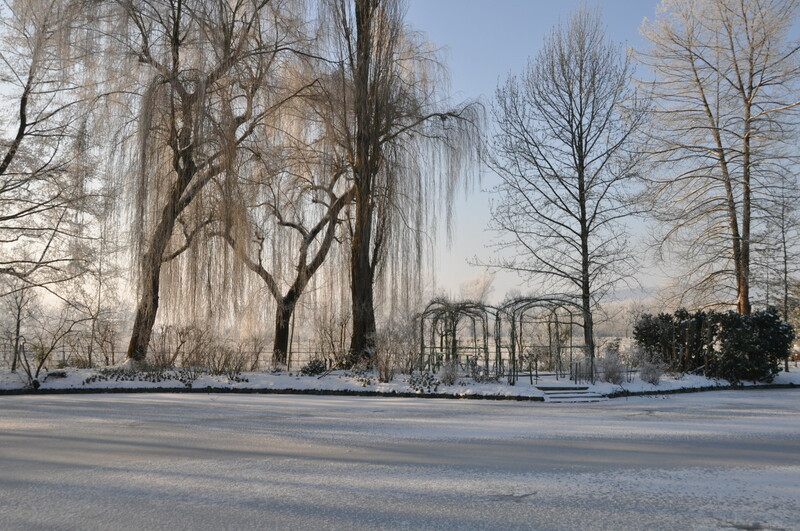 This is not the winter we are having at Giverny this year. The last time Monet’s water lily pond looked that way was in 2012. It was so beautiful then! I roamed in the gorgeous yet closed garden and couldn’t look and shoot enough. The landscape turned white is not that frequent at Giverny. Although we do get a few flakes every winter and a few nights of frost, generally the weather is more humid than cold. It is overcast, it rains, but not cats and dogs, only kittens and puppies, you know. Patience. All this will soon be over. Fondation Claude Monet opens rain or shine on March 25, 2016, and the seven-month flower show wil be more beautiful than ever.